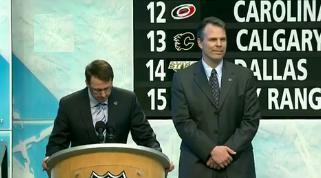 Doubtful the Flames part with their 1st round pick this year. In general I'd prefer to keep our first so we don't bottom out on picks, but this is a special year and Panarin is unreal, like a superstar and could truly be what puts over the top for a cup. I would SOOOO give up a late first for Panarin, I'd drive that first round pick to the airport myself. I actually think it would be insane to NOT pay a late first for Panarin for a playoff run if that was actually available. However A) No way Columbus is trading him, imo and B) If they did he'd likely fetch a first ++ and possibly another + even as a rental. It's not insane to give up a first rounder. But it would be insane for CBJ to accept a late first rounder for a franchise player when they're in the midst of fighting for the division championship. That's just it. But I was just responding to Estrada's assertion that he wouldn't wan to do it. I agree with him in a general sense, but for the right player you do it, imo. Especially considering we'll likely be a late late first. A lot of rentals don't work out, but Panarin would be a truly special rental, a true superstar scorer and you accept that deal so ****ing fast if it was on the table, imo. But yeah, no way they trade him unless they collapse. And if they do and he is available I want Brad all in on that. Last edited by jayswin; 01-28-2019 at 06:23 PM. I think playoff rentals are just the biggest waste of assets and GMs that frequent these deals aren't the type of people you want at the helm. I'd like to see stats on how many productive players came out of draft picks being swung for a rental, especially first rounders. Drafting and developing a player(s) to keep your team competitive down the road is way more important than the mystery box one guy brings to your team for a finite amount of games that didn't need a distraction to its chemistry in the first place. But doesn't almost every contender pick up rentals, though? And if so, just the fact that only one team wins the cup would make them look statistically "bad" but that shouldn't stop teams from attempting to leverage the condensed cap space into a cup. Apologies to ErickEstrada, just realized I misread your post. Thought you were saying you wouldn't want to, you were actually saying you doubt the Flames do. Kekäläinen is really in a situation where he can't win right now, and he probably should have acted a lot sooner both with Bobrovsky and Panarin, but that's easy to say now. If he trades them away, he will not get a return that will be satisfactory to anyone because teams won't spend that big on rentals, and he guts his own team just before crunch time of the season. If they stay the season, get bumped early in the playoffs and walk for nothing in july he might even be in tough to keep his job. His best bet to get out of this situation in decent shape is to hope and pray that Columbus wins the Stanley Cup, or at the very least reaches the finals. That's a tall order. I don't envy the man, but he really should have anticipated this situation and taken care of it even before the season started. There’s no way Columbus can get through Tampa, TO or Washington with their current squad....I think you gotta bite the bullet here and get some assets back. You know those two will walk after the season. Talk about being between a rock and a hard place. I don't envy Columbus's decision here. Really hoping for Panarin for Voracek. Damned if you do, damned if you don't. I don't have the pulse on that fan base but as a GM I feel you have to be realistic about your chances in the current season with eyes on the future. They aren't going to win the Stanley Cup this year and will have a tough 1st round match-up with or without these two players. I probably sell both and have my scouts working overtime from now until July. Fans really don't reminisce about 1st round exits which is the likelihood with these players in the lineup and to me that's just not worth the cost of accelerating the decline of the franchise by seeing your two best players leave for nothing. When you consider the hauls that Ladd and Hanzal got at the deadline, Panarin would be worth an absolute fortune. So would many other teams, along with other pieces. It almost feels (there’s no proof) like Tortorella doesn’t like Russian players. They don’t want to play for him. Seems to be the case (to me, anyway). It's not about Tortorella. A lot of Russians only want to play in a handful of cities. Whether it's the draw of a large Russian ex-pat community, or the weather, they want the greater New York area, Chicago, L.A., and a few sunbelt hotspots. The problem for Columbus is if they don't deal him to one of those handful of markets, it'll be a pure rental deal. This is why I'm glad the Flames don't have any Russians on the roster. You don't have to worry (as much) about the 'I don't want to play in this city' factor. I don't think the GM is in that hard of a spot. Both players have essentially come out and said they won't return and want to reach UFA. Any educated Jacket fan has to know that trading them for a haul is the best move. A good GM makes the hard choices and gets returns on those players. The Jackets are certainly in playoff contention. But IMO they aren't a cup favorite barring some miracle run. The GM can't bet on miracles. He has to look at not only his team, but the teams they are competing against and has to decide if they can make a cup run. With teams like TB, Toronto and Washington going up against them, in his heart he has to know this isn't the season. Selling off both players for big hauls likely moves them into contention as early as next season and beyond. I know if a Flames' player publicly stated he wants to be a UFA and the team isn't a cup favorite, I would be on-board with trading them for a good return even if they were in a playoff spot. The GM can trade both players and if at any point he starts receiving backlash, he can easily point to both players publicly saying they won't be around next season. They have both essentially made it easier for the GM to justify the trades. Trading them both hurts the team short term. But long term IMO it's the right move. Last edited by Huntingwhale; 01-29-2019 at 08:09 AM. Washington didn't. Turned out OK. TB didn't get a rental of note. They made a couple good non-rental acquisitions though. Nashville didn't rent anyone. Nor did Pittsburgh. Vegas picked up Tatar but it turned out he played only 8 games in the POs and got 2 points so I wouldn't say he was a factor. Winnipeg got Stastny who helped them into the finals. Boston rented Nash who didn't. SJ semi-rented Kane since they had an option. Last edited by Phagoof; 01-29-2019 at 08:26 AM. While I largely agree, its not that simple for Kekunspellablelainen. Bob and Panarin havent explicitly stated that they wont stay with Columbus, just that they wont negotiate during the season and want to test the UFA market. They could still stay and be cornerstones of the team but just use UFA as a bargaining chip to increase their contracts, but if you trade them then they almost certainly wont be back. I'd love to nab Panarin though. Maybe a Kane-like conditional first (plus other assets) for Panarin. That way you can wait for Neal's allergies to kick in in the offseason. OTOH, Panarin's nickname is "Bread Man" so not a fit with Mangiapane. No, can't see it. As fans we see maximizing return and moving players out at the right time as obvious, but you have to remember there's way more at play for a professional sports organization. Moving stars out when you're a contender is going to destroy that locker room's faith and relationship with the team going forward. Almost zero chance they do it unless they can get a star in return but what team is going to do that when Panarin's going to free agency. My guess is Panarin and Bobrovski will both be part of the run and then will become two of the biggest FA's this summer. Is Colombus a contender though? Tampa, Toronto, Washington, Boston, Pittsburgh. Islanders and Habs are both playing great. As a fan I think Id want assets back. As a player maybe you want those guys for the run but at the same time if you plan on being with the organization for the next few years then some assets back helps as well. If you lose those guys for nothing youre going all in for this season when your odds are terrible. Tough decision Im glad another organization has to make.